The Suffers' 'Everything Here' Embroiders A Multidimensional Groove On the group's second album, Kam Franklin and The Suffers revel in the multidimensional, multicultural possibilities of their take on soul. The Suffers' Everything Here comes out July 13. Early on, Kam Franklin didn't take kindly to being told that since the world already had Sharon Jones & The Dap-Kings and Brittany Howard and her fellow Alabama Shakes, there just wasn't a slot available for another woman of color fronting a soul outfit. "I found it hard to believe that in an industry filled with festival lineups that had tons of young white male musicians, wearing the same outfits and playing similar chord progressions, there was no room for me and my band," Franklin wrote in an open letter. She and the seven other members of The Suffers didn't let such double standards and reductive reads on their musical identity stand. On the band's second album, Everything Here, the musicians revel in the multidimensional, multicultural possibilities of their take on soul, recalling in spirit the way that the Shakes' sophomore album complicated their southern soul revivalist image and Leon Bridges' follow-up challenged the perception that he hewed to vintage, Sam Cooke-indebted soul-pop gentility. Various members of the Suffers' horn-heated lineup — guitarist Kevin Bernier, keyboardist Patrick Kelly, bassist Adam Castaneda, drummer Nick Zamora, percussionist Jose "Chapy" Luna, trombone player Michael Razo and trumpeter Jon Durbin — previously put in time in cumbia, reggae, ska, hip-hop, soul, rock and country groups. There was a time when they even received nods in the "Best Reggae/Ska/Dub" category of their hometown music awards. As recently as this year, Franklin released a solo EP reinterpreting songs by Korn, Godsmack Deftones and A Perfect Circle as chilly, introverted alt-R&B. These are musicians who take pleasure in embroidering an array of styles and grooves into their collaborative songwriting and arrangements. 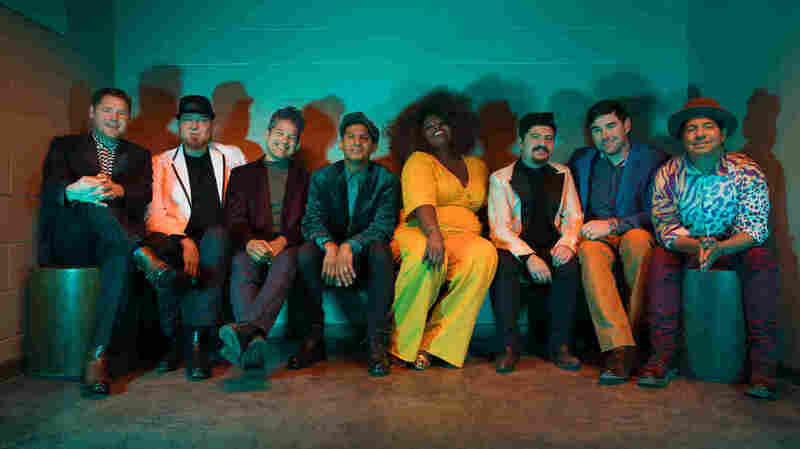 The vividness and conviviality of The Suffers' new collection of 15 tracks, if not its actual sound, recalls the immersiveness of Earth, Wind & Fire — the way that EWF illustrated entire universes through its performances and, in Jason King's words, "envisioned polyrhythmic pop as a musical antidepressant." Not that the younger ensemble is after quite such an otherworldly presentation. As cosmopolitan as The Suffers are, they're also imaginatively grounded in place. The lively textures of their vision of Houston, their shared hometown, animate their album. Everything from their musical interplay to their choice of guests (Bun B and Paul Wall, who both came up in the local rap scene, supply suave, lighthearted spoken interludes) and expressions of empathy for a city still recovering from hurricane devastation contributes to Everything Here. In "After the Storm," Franklin and guest crooner Lyle Divinsky (of The Motet) depict neighborly concern and resilience. They take turns intoning a plainspoken liturgy of encouragement: "I wanna see you / I wanna see you / I wanna see you / after the storm. / You live right next to me. / I can see, I can see over your fence. / If you need anything / just call on me." Then they play out a subdued phone exchange between friends checking in on each other. The track quietly captures the healing power of letting people know they're not alone in their suffering. "You Only Call" depicts the opposite scenario: one-sided exploitation in the place of mutual caring. It's a great example of the group's use of meaningful repetition. Over twinkling neo-soul keyboards and a suave, sensual groove, Franklin continually circles around the line: "You only call when you need something," letting wearily ragged groans creep into her vibrato. Adopting a breathier timbre, she carries the same words into the chorus, letting the backup singers finish each line, with tendrils of organ and pedal steel gently curling around them. "What You Said" is the sort of sleekly funky, post-disco R&B that gets folks on the dance floor. A vamp late in the song accentuates first the arrangement's uptown, symphonic soul elements, then its Latin flavor, but the lyrics aren't so blissful, depicting the laborious, confrontational side of intimacy. On the flip side, the early, flirty stages of intimacy are the focus of percolating soul-jazz number "The One About Sace." "So," Franklin winds up, before delivering her conversational inquiries in punchy bursts, "What's your favorite color? Oh, you say you like Nas, too? You were raised by your mother and her village? Yeah, that's cool." Franklin's a dynamic, personable, sometimes jazzy singer. She tends to summon emphatic, real-talking clarity with her delivery and exaggerate her enunciation for the sake of expressiveness. There's often a frisky contrast between her phrasing and the band's rhythmic ideas. During "Everything Here," The Suffers' instrumentalists execute a low-slung reggae groove, while Franklin, adopting an antsy vocal pattern, frets over how her mother would see the state of disrepair in her heart and home. All of the band members' mothers make appearances in an album interlude, talking about their affection for their kids. That sets up the song "Mammas," an urbane soul tune peppered with staccato, Latin-tinged piano figures that voices appreciation for motherly devotion. "Do Whatever," a reminder to relax, begins with children chanting over the rhythm section's swinging syncopation and the horns' scampering, descending runs. Franklin sings her part with unfettered exuberance. When it's all over, amid the chattering of the band's young guests, a kid can be heard summarizing the experience perfectly: "Aw, that was fun!"